Whenever I read The Cycling Anthology (Peloton Publishing RRP £8.99) I often find myself conjuring an unusual vision. At the back of my mind – in between images of high alpine passes or desperate bunch sprints – appears a vision of an impossibly overcrowded spare room somewhere near Watford.. It’s rather reminiscent of the famous last few frames of the first Indiana Jones film or the final revealing scene from Citizen Kane where Rosebud is tantalisingly glimpsed amongst the mountains of artefacts that the millionaire newspaperman and politician had amassed over a highly eventful lifetime. Albeit on a slightly smaller scale, and with towering piles of books instead of the “Loot of The World” (as Charlie Kane’s hoard is memorably described) this is how I like to imagine Peloton Publishing. The truth is, expectedly, more prosaic than the legend – not that that would have bothered Kane too much; he would have printed the myth anyway – and it’s many years since Lionel Birnie’s spare room also functioned as the warehouse and dispatch centre for the publishing company he owns. Housing the growing print run of the Anthology – now in its sixth edition – outgrew his Hertfordshire home almost immediately and Lionel and his co-editor Ellis Bacon now have off-site storage. I should admit at this point that I have a soft spot for the Anthology. Like many others I enjoy the excellent writing to be found within its usefully pocket-sized pages. Equally I love the sense of adventure that the constantly shifting pace and tone of the chapters (and the Simon Scarsbrook artwork) engenders: when you pick up an Anthology you are starting off on a journey where you know neither the destination nor the route. Lastly, and perhaps most importantly for this post, I hugely admire the communal ethos that underpins the whole enterprise. Each writer – whether a feted doyenne of the pressroom or a previously unpublished newbie – gets an equal share of the profits. It’s a lovely idea and, it seems, a successful one. So how did it all get started and how does the process work? I spoke to Lionel to get the lowdown on the Anthology. So where did Lionel’s co-editor (and contributor of some of the more esoteric offerings in the various volumes) Ellis Bacon come into the picture? Surprisingly, Lionel had not worked with him much prior to embarking on the first edition of the Anthology. “I actually can’t remember where I first met Ellis. It must have been out on the road somewhere while covering a race. At the time he was working for Procycling and I wrote for Cycle Sport. It wasn’t until Ellis moved to Cycle Sport that we had any real contact and even then we didn’t really work together. I think the first meaningful conversation we had was at a Christmas do in 2011. But I think we quickly realised that we’d basically had the same sort of introduction to cycling as youngsters and we found that we enjoyed the same things about the sport – Channel 4’s Tour coverage; the same interest in obscure races from the 1980s and 1990s; quirky jersey design. Ask Ellis what sunglasses a rider was wearing in the 1987 Tour and he’ll probably know. During his early conversations with fellow journalists about the idea, Lionel learnt that Ellis was thinking about something along similar lines, although he was looking at doing it online. Lionel called him up and pitched the idea of a print edition. The pair have co-edited every edition since. I have met both Lionel and Ellis on various occasions but never at the same time so I was really intrigued to learn about how they work together. I had also heard that Ellis had recently moved to Australia, which seemed to put whatever previous arrangement they had into potential jeopardy. “When Ellis lived in the UK, we’d meet up every now and again, usually over lunch, and spend a couple of hours talking about nonsense before getting round to the Anthology. Now he’s in Australia we talk on Skype. “We never work together, I’d say we dovetail. We share out the jobs pretty evenly. Generally, Ellis gives everything a first read when it comes in and I then typeset the chapters on the page. In the past, the books were stored in my spare room but we’ve got a proper storage unit now. But I still post out any individual orders and arrange for copies to get to retailers and all that.” I’d heard the story of the books being stored in the spare room when I first started reading the Anthology and was slightly saddened to learn that Birnie and Bacon hadn’t returned to this practice after taking back publishing duties from Yellow Jersey Press, with whom they had collaborated for Volumes Four and Five. But we are getting ahead of ourselves by taking about printing, promoting and posting. I wanted to find out more about the writing and editing process that must be so key to the Anthology’s success. 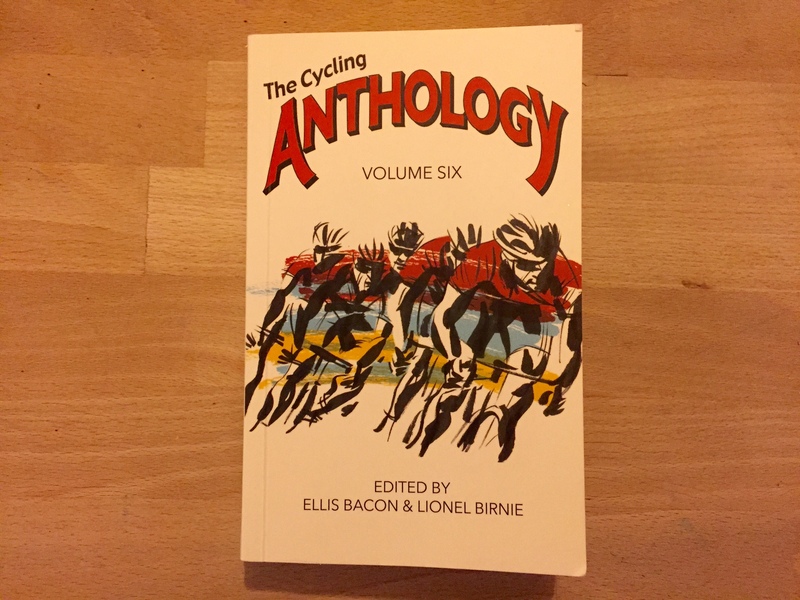 Many of the contributor’s are Anthology regulars on whom you can depend to pop up in almost every edition and Volume 6 has excellent pieces from stalwarts such as Sam Abt, Ned Boulting, William Fotheringham and Brendan Gallagher. But the writing pool has perceptibly widened in the last three books and I was intrigued about how a couple of the first-timers had got on here. Felix Lowe writes columns for Eurosport and Cyclist magazine and has written a book on cycling previously but Kathy Lemond – wife of 3-time Tour de France and double World Champion Greg Lemond had no writing experience before getting involved with the Anthology. How did they both approach the task and what additional challenges does working with such a wide range of authors demand of the editors? The production time for an Anthology seems to be about 10 months. Even in the focussed environment of a two-man publishing house, things move slowly in the world of print. Felix submitted his pitch in late January and and got a go ahead a couple of weeks later. Lionel and Ellis set a deadline of early May for the piece and the editing process happened between the Giro and the Tour. Presses rolled in late August and the books arrived back at Peloton’s warehouse in October. It was only after my first conversations about the editing of Volume 6 that I actually noticed that Birnie and Bacon had taken the publishing back in-house. There had been a noticeable shift in the cover artwork (and thickness of each volume) when Yellow Jersey got involved for Volumes 4 and 5 and, once you clock that it’s back with Peloton, it’s clear to see that the look of Volume 6 is a composite of the two styles that have gone before. I went back to Lionel to ask about why the change of heart? He was as candid as ever, “I think, having established the series in the first couple of years, it felt like the logical step to see whether a major publisher could add to the strength of the series. There was interest from a couple of other companies but Yellow Jersey Press seemed like the perfect home for the Anthology because it has such a strong stable of cycling books. At the time we agreed to work with them, it felt like the Anthology had grown so quickly and we were struggling to cope with it. The first couple of editions we printed what we thought would be the right amount (although we really were taking a guess at it). The problems we faced were boring, practical ones such as storage. At the start it felt wrong to be paying hundreds of pounds on warehousing before our writers saw a penny for their work, so we were sort of limited to a print run that would fit in my spare room and office! That turned out to be insufficient and so we did a second run of each book, which is the least efficient way of producing something. So, when we had this interest from some major publishers, it came at exactly the right time because we knew the really hard work – the printing, the storage, the distribution – would be taken off our hands. After two books, the contract with YJP expired and we all agreed not to renew it. It was all very amicable. I think we found it hard to let go of this thing we’d created from scratch. I must stress, they were great to work with. They didn’t interfere or dictate to us at all. We still edited in exactly the same way. It’s just we lost control of the ownership of the thing. In the year or so that we didn’t have to worry about storage, distribution and all those other practicalities, we’ve solved a few of those problems because of the way the football titles I’m involved in have grown. We now have warehousing that doesn’t break the bank and a better way into the supply chain. 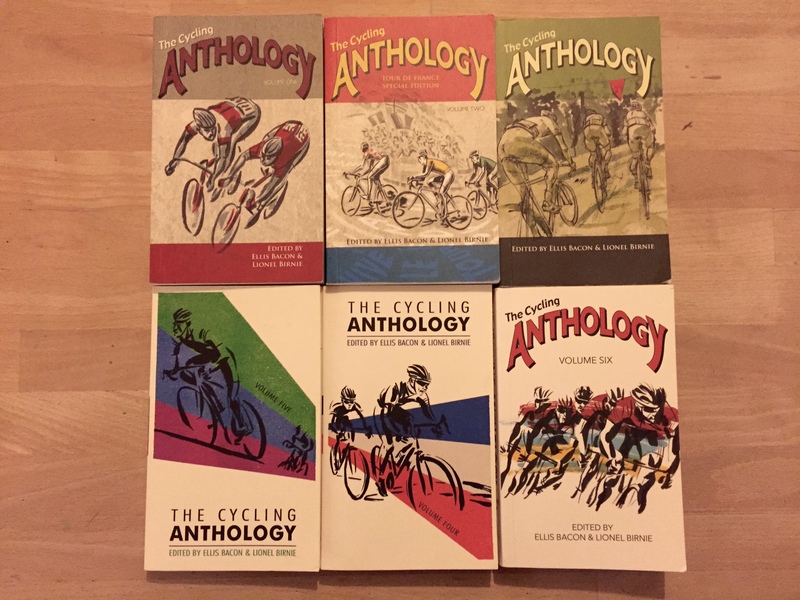 Some of the older Volumes of the Cycling Anthology can still be bought from a wide variety of booksellers. For Volume Six Lionel favours Prendas, who offer free UK postage. This entry was posted in Interviews, Product Reviews and tagged birnie, Cycling, cycling anthology, ellis bacon. Bookmark the permalink. I’m an anthology fan, and you’ve just reminded me that I haven’t got around to reading 5 yet, nevermind 6. Must rectify that! 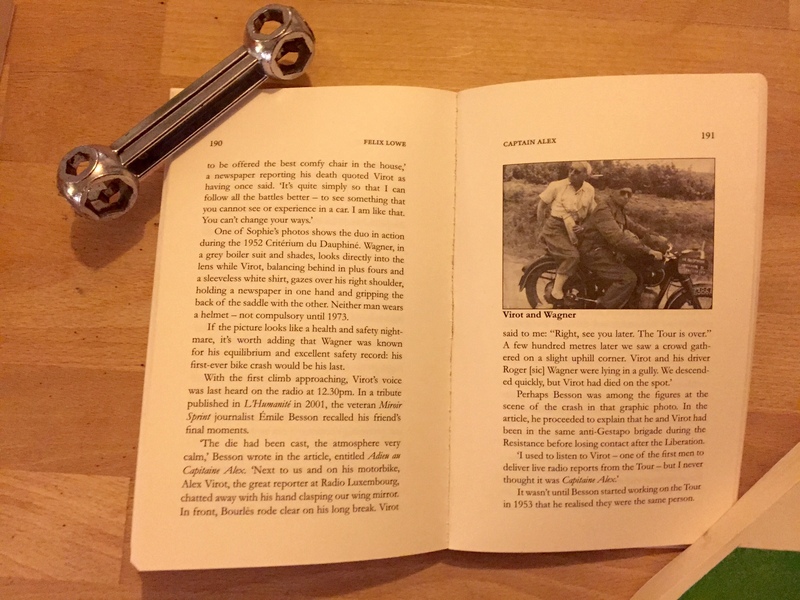 Enjoyable read Howard – an excellent background to what the Anthology and Peloton Publishing is all about. I also enjoy Lionel Birnie on the Telegraph Cycling Podcast, which is required listening in our house. It’s required listening in my house too. I did a behind the scenes on the podcast a while ago and felt that doing something similar for a book would be good too.